Wild-caught salmon and other fish are rich in nutrients, including selenium, high-quality protein, and astaxanthin, a carotenoid that gives fish their pinkish hue. Some people don’t care for fish, find it too expensive to eat regularly, don’t like to cook it, or otherwise don’t consume it regularly. Frequently eating fish that is high in mercury can lead to elevated levels of mercury in the body, which is toxic to the human brain, kidney, liver, heart and nervous system, and can disrupt thyroid function. So how can the many benefits of anti-inflammatory fatty acids be obtained safely for those with Hashimoto’s? Essential fatty acids (EFAs) are naturally occurring fats that the body cannot produce, therefore they are essential. They must be derived from either whole foods (like fish) or supplements. Theoretically, the body can convert LA into a longer-chain omega-6 fatty acid (arachidonic acid), and ALA (the predominant omega-3) into the longer-chain EPA and DHA found in seafood and a few other animal foods. However, the process of elongating these fatty acids is often inefficient, because the same enzyme system deals with both omega-3 and omega-6 fatty acids. Most diets are much higher in omega-6s, so the enzyme system tends to focus on these rather than omega-3s. The body also requires sufficient amounts of vitamin B1, B6, zinc, and magnesium to convert ALA to EPA and DHA. (However, these are often deficient in those with Hashimoto’s. You can read more about magnesium and zinc deficiencies in my articles.) Insufficiencies in any of these nutrients could limit the body’s conversion of ALA to EPA and DHA. EFAs help manage inflammation and autoimmunity, promote blood vessel health, support healthy skin growth, provide the precursors to balance hormones, and support healthy brain and nervous system function. They are considered essential because our bodies need them for so many reasons. The body requires about a 1:1 ratio of essential omega-3 and omega-6 fats for proper immune function and all the other roles EFAs play. Today, the average person on the Standard American Diet (SAD) eats a ratio of as high as 25:1, with way too many omega-6 fats compared to omega-3 fats. This can be a problem because omega-3 fatty acids reduce inflammation, while omega-6 fatty acids can promote inflammation. Inflammation serves a protective role in our bodies when the immune system is in balance, but in excess (as it is with autoimmune conditions), it can be problematic. Many of us, especially those on the Standard American Diet, get too many omega-6 essential fatty acids and not enough omega-3 essential fatty acids, because we consume meat from animals fed grain, soy, and other foods that are not part of their natural diet. Even the healthiest diet will contain some omega-6s (we want about an equal 1:1 ratio), but they should be nowhere near the amount many people consume. Grain-fed meats (including farm-raised fish) are big culprits. Most store-bought salad dressings, condiments, chips, artificial cheeses, roasted nuts, cookies, crackers, snack foods, and sauces, and almost everything in the middle aisles of the grocery store, also contain these oils. To further complicate things, omega-6 acids can easily become oxidized in body cells, as well as when they are exposed to heat or light. These oxidized fats can cause more inflammation and mutation in cells while also increasing one’s risk of cancer. Overall, this extreme imbalance between omega-6s and omega-3s creates a very inflammatory environment that plays a role in many chronic conditions, including heart disease, diabetes, autoimmune disease, and conditions that degenerate the brain. In fact, researchers estimate that up to 80 percent of Americans don’t get enough anti-inflammatory EFAs daily. It isn’t just that we eat too many omega-6 fatty acids. These inflammatory fats can crowd out the anti-inflammatory fatty acids, and the body may convert the anti-inflammatory fats to inflammatory fats, making us even more deficient in EFAs. Focusing on getting a healthier omega-3 to omega-6 ratio by eating more foods rich in omega-3 fatty acids while reducing omega-6 fatty acid intake may reduce inflammation and help to restore immune balance. Altogether, it is far more efficient to cut out the middleman and get EPA and DHA directly from wild-caught seafood, rather than depend on the body’s enzyme system to convert ALA into EPA and DHA. However, eating farm-raised fish can be problematic for several reasons. Among them is the fact that these fish are kept in pens and fed grains, as well as other foods that fish don’t normally eat. When we consume farm-raised fish, the artificial ingredients and harmful fillers in their food will contribute to our toxicity load. Some people may also be sensitive to these added fillers. Furthermore, because eating their unnatural diet gives farm-raised fish a grayish hue, farmers feed the fish a synthetic version of astaxanthin to mimic their naturally pink hue. So, when introducing more seafood into one’s diet, it’s important to find quality sources to obtain optimal amounts of nutrients and minimize potential harmful fillers. I get my seafood from Vital Choice Seafood and Organics, which is a trusted source for fast home delivery of wild seafood and organic fare, harvested from healthy, well-managed wild fisheries and farms. Additionally, even with healthy sources, those with Hashimoto’s should use caution when consuming increased amounts of fish. Numerous studies (including the National Health and Nutrition Examination Survey or NHANES) have concluded that eating fish is the primary driver of elevated levels of mercury in the body (1). Mercury is toxic to the human brain, kidney, liver, heart and nervous system. It can also disrupt thyroid function. People who regularly eat high-mercury fish can experience nervous system damage as well as various symptoms, including sleep disturbance, headaches, fatigue, memory problems and not being able to concentrate well. However, even regularly consuming low mercury, wild-caught seafood might not provide therapeutic amounts of the EPA and DHA that the body requires to reduce inflammation. Fortunately, for those with autoimmune conditions like Hashimoto’s, there is another way to get those health-promoting fatty acids. That’s where fish oil supplementation can help, especially if getting the right seafood can feel like a challenge. Due to their role in immune function, omega-3 fatty acids are especially important for anyone with an autoimmune disease like Hashimoto’s. In fact, many autoimmune diseases are characterized by a high level of interleukin 1 (IL-1) and the pro-inflammatory leukotriene LTB(4), produced by omega-6 fatty acids. While taking omega-3 acids in the form of fish oil or cod liver oil has been found to be helpful in a variety of autoimmune conditions, few studies have directly focused on the benefits of fish oil for thyroid issues and Hashimoto’s. One rodent study did find that a long-term diet rich in omega-3 EFAs lowered serum triglycerides and cholesterol while enhancing thyroid hormone signaling pathways in the liver (2). Another study compared the number of thyroid antibodies in pregnant and postpartum women who ate oily fish high in omega-3 acids (such as sardines) versus swordfish. Thyroid antibody levels were found to be lowest in the group that consumed fish that were high in omega-3 acids, suggesting that oily fish that are high in omega-3 acids can be beneficial for preventing autoimmune thyroid issues after pregnancy (3). 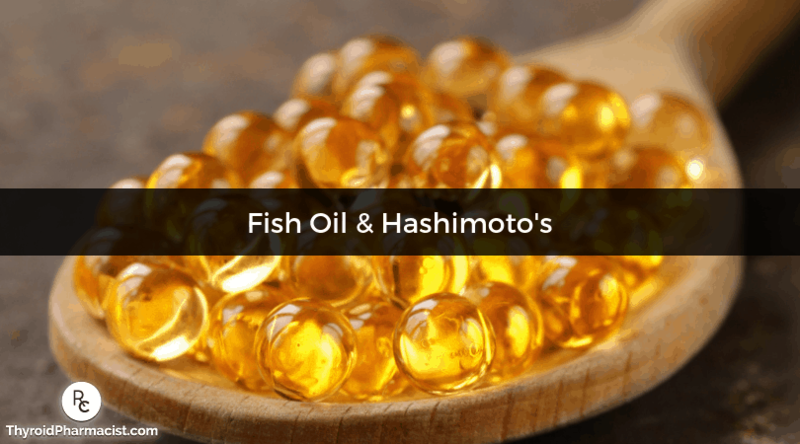 Even if most research hasn’t focused directly on fish oil for Hashimoto’s, many studies do support fish oil’s ability to improve a variety of symptoms and conditions associated with Hashimoto’s. Animal experiments and clinical intervention studies support the anti-inflammatory benefits of omega-3 fatty acids that researchers argue could help manage autoimmune diseases, as well as inflammatory conditions like migraine headaches. Researchers have found that the mild anti-inflammatory effect of regularly taking fish oil leads to therapeutic improvement in critically ill patients, particularly in disorders where inappropriate activation of the immune system occurs. Many placebo-controlled trials of fish oil for chronic inflammatory diseases show that they can decrease disease activity and encourage a lower use of anti-inflammatory drugs (4). Some studies have even shown that the anti-inflammatory impact of fish oil can prevent relapse of diseases such as rheumatoid arthritis and Crohn’s disease (5). But it isn’t just inflammation that fish oil benefits. These omega-3 fatty acids can also help manage oxidative stress, which often goes hand-in-hand with chronic inflammation for people with Hashimoto’s. One study found EPA and DHA could improve oxidative stress-induced DNA damage in vascular endothelial cells (cells that line the body’s circulatory system from the heart to the capillaries) through the upregulation of the NRF2-mediated antioxidant response (which regulates the antioxidant response in the body), partly explaining why fish oil can help prevent cardiovascular disease (6). There is some opposing research that suggests fish oil has the potential to actually increase oxidative stress. Most studies, however, show that fish oil often does just the opposite: it can increase antioxidant activity and decrease oxidative stress. Researchers also argue that even if it does, it would not increase oxidative stress enough to overpower the body’s antioxidant defenses, and that the benefits outweigh this potential problem. Pain management. Pain is a primary symptom that people with Hashimoto’s frequently experience. Research shows that compared with ibuprofen, omega-3 EFAs could equally reduce arthritic pain and be a safer alternative to NSAIDs (7). Brain health. In Hashimoto’s Protocol, I discuss my experience with brain fog, a common symptom in those with Hashimoto’s. Omega-3 fatty acids provide powerful anti-inflammatory support for the brain. Supplementing regularly can improve cognitive performance, including memory, concentration, and learning abilities. Depression. Hundreds of millions of people suffer from major depression disorder, and depression can be a debilitating symptom of Hashimoto’s. Pharmaceutical drugs are often not very effective and can carry side effects. While the overall evidence is inconclusive, a number of studies show that omega-3 fatty acids can be very effective against the treatment of major depression disorder and other psychiatric disorders, with no associated side effects (8). Gut health. Emerging evidence highlights how fish oil impacts the microbiota composition by producing anti-inflammatory compounds like short-chain fatty acids. Animal studies also show the interplay between gut microbiota, omega-3 fatty acids, and immunity to maintain intestinal wall integrity. Furthermore, human and animal studies show the ability of omega-3s to influence the gut-brain axis (10). Many gut disorders associated with Hashimoto’s, including intestinal permeability or leaky gut, have an inflammatory component. Thus, the anti-inflammatory and intestinal wall-supporting properties of fish oil can help to improve these conditions. Adrenal function. Adrenal imbalance may initiate or exacerbate many symptoms that overlap with Hashimoto’s, including mental fog, a decreased ability to handle stress, mild depression, reduced productivity, poor memory, feeling overwhelmed, and feeling tired despite adequate sleep. Research indicates that fish oil can help to stabilize adrenal function, especially during times of stress. Liver health. Mobilized toxins in the liver produce inflammation, and if left unchecked, this inflammation can lead to an exacerbation of symptoms such as fatigue, pain, and headaches. (You can read more about liver toxicity here.) Fish oil can help tame this inflammation and support a healthy liver. As previously discussed, increasing one’s consumption of omega-3 fats can help to prevent an inflammatory environment and its associated problems. The longer-chain EPA and DHA fatty acids can be found in wild-caught seafood. Grass-fed meats also include a good amount of these omega-3 fatty acids. Freshly ground flaxseeds, chia seeds and walnuts are great sources of ALA. However, it’s important to note that nuts and seeds are often food sensitivities for those with Hashimoto’s. For that reason, the easiest and most effective way to get sufficient and balanced levels of ALA, EPA and DHA is to take a fish oil supplement. However, many of these benefits overlap, and I believe a good supplement will include roughly equal amounts of each of these two essential fatty acids. While research suggests DHA is the more effective essential fatty acid for cognitive function, I’ve found evidence that both of the two EFAs support the brain. One study found a EPA-rich supplementation created better cognitive performance than prior to supplementation. Interestingly, the DHA-rich supplement was not as effective for neurocognitive functioning after a 30-day supplementation period compared with the EPA-rich one (11). Low amounts of EPA and DHA. These two fatty acids are the most-studied for their benefits. A supplement might say “1,000 mg of omega-3s per serving,” but what matters is the amount of EPA and DHA per softgel. Many commercial brands have very low amounts of EPA and DHA. Subpar quality control. Poor-quality fish can contain impurities that increase one’s risk for heavy metal toxicity. Furthermore, improper storage methods that expose supplements to heat, light or anything else that can damage the oil can cause oxidation, which can turn antioxidants into pro-oxidants and increase one’s risk for inflammation. Shelf life. Even if a supplement has an expiration date, it could have sat on a shelf for months or years. Freshness matters with fish oil. High-quality formulas will also include antioxidants like mixed tocopherols (vitamin E) to protect the fragile omega-3 fatty acids. When we consider these factors, a bargain is not really a bargain with most store-brand fish oils. Instead, look for a professional quality fish oil supplement that has been molecularly distilled and filtered, such as EPA/DHA Essentials by Pure Encapsulations or OmegAvail™ Synergy by Designs for Health. This process ensures purity and helps eliminate contaminants including heavy metals, pesticides, solvents, and PCBs. Depending on the condition, I recommend one to four grams of fish oil daily. If burping occurs after taking, freeze the supplement before taking it. For optimal absorption, I recommend taking fish oil with a meal containing quality fats. It’s important to note that omega-3 fatty acids may increase a person’s risk of bleeding. Talk with your practitioner before taking omega-3 fatty acids if you take blood thinners such as warfarin (Coumadin), if you have a bleeding disorder, or if you have any other concerns about using fish oil. Omega-3 fatty acids can be greatly beneficial for those with Hashimoto’s, as they can reduce inflammation, regulate the immune system, and help to prevent postpartum autoimmune thyroid issues. They have also been associated with improving brain health, pain management, depression, skin issues, gut health, adrenal health, and liver toxicity. While omega-3 can be found in wild-caught seafood, nuts, and seeds, taking a high quality fish oil supplement like EPA/DHA Essentials by Pure Encapsulations, OmegAvail™ Synergy by Designs for Health, or cod liver oil can ensure you’ll get sufficient levels of both EPA and DHA — without the risk of heavy metal contamination. To learn more about other supplements that can help with thyroid symptoms, (including the supplement that helped me recover from almost a decade of fatigue, within just a few short days), grab my FREE Supplements to Subdue Symptoms eBook! PS. You can download a free Thyroid Diet Guide, 10 thyroid-friendly recipes, and the Nutrient Depletions and Digestion chapter of my Root Cause book for free by subscribing to my weekly newsletter. You will also receive occasional updates about new research, resources, giveaways and helpful information. For future updates, make sure to follow us on Facebook, too! Groth E. Fish Consumption and Blood Mercury Levels. Environ Health Perspect. 2014 May;122(5):A120. Souza LL1, Nunes MO, Paula GS, Cordeiro A, Penha-Pinto V, Neto JF, et al. Effects of Dietary Fish oil on Thyroid Hormone Signaling in the Liver. J Nutr Biochem. 2010 Oct;21(10):935-40. Benvenga S, Vigo MT, Metro D, Granese R, Vita R, Le Donne M. Type of fish consumed and thyroid autoimmunity in pregnancy and postpartum. Endocrine. 2016 Apr;52(1):120-9. doi: 10.1007/s12020-015-0698-3. Ergas D, Eilat E, Mendlovic S, Sthoeger ZM. n-3 Fatty Acids and the Immune System in Autoimmunity. Isr Med Assoc J. 2002 Jan;4(1):34-8. Sakai C, Ishida M, Ohba H, Yamashita H, Uchida H, Yoshizumi M, et al. Fish Oil Omega-3 Polyunsaturated Fatty Acids Attenuate Oxidative Stress-Induced DNA Damage in Vascular Endothelial Cells. PLoS One. 2017 Nov 9;12(11):e0187934. Wani AL, Sajad SA, Ara A. Omega-3 Fatty Acids and the Treatment of Depression: A Review of Scientific Evidence. Integr Med Res. 2015 Sep;4(3):132–141. Golandam G, Young J, Burns-Whitmore B, Spalding T. Effects of Fish Oil Supplementation on Inflammatory Acne. Lipids Health Dis. 2012;11:165. Costantini L, Molinari R, Farinon B, Merendino N. Impact of Omega-3 Fatty Acids on the Gut Microbiota. Int J Mol Sci. 2017 Dec;18(12):2645. Bauer I, Hughes M, Rowsell R, Cockerell R, Pipingas A, Crewther S, et al. Omega-3 Supplementation Improves Cognition and Modifies Brain Activation in Young Adults. Hum Psychopharmacol. 2014 Mar;29(2):133-44. Thank you for your good and generous information. I live in Norway and eat plenty of fish….but my advice is to stay well away from farmed salmon! Taking once a day or less. I am losing much hair when I wash it. I have Hashimoto and trying to eat proper foods. My MD will not give me a Med for this. She said she is aware that I have this thyroid condition but med is not given anymore. I was dismissed but Endocrinologist. I do see my MD once a yr for Physical. This article is so interesting and has come at the right time. Im 69, female and have had Hashimotos for 9 years, I am in South Australia. Wasted so much time with GPs (General Practitioners) who do not understand that Hashimotos is auto immune, Have Izabella’s 2 books and I know I am on the road to recovery, inspite of some doctors. I went to a MTHFR doctor 14 months ago and he messed around with my T3 and reintroduced Thyroxene, synthetic T4 which just doesnt suit me. I knew he did not know what he was talking about when I brought up selenium, he was not familiar with it! It was then I found an integretive doctor. He put me back on 25 mcg of T3 twice a day, with a few variations, I asked him if he would give me 50mcg T3 and I take it at night, just before bed with my magnesium citrate. This means that I am not hanging around with not eating for an hour in the morning and I do have an occasional weak real coffee about 3 times a week. I have even noticed slightly better sleep with taking T3 slow release at night. Anyway back to your article, when I was young in the UK and in boarding school, twice a week in the winter (awful winters) we were given 1 teaspoon of cod liver oil, this was to build us up against colds and flu. Last year I bought 400 capsules of cod liver oil (after checking first where the fish were sourced) and I also take Primrose oil daily. I wouldnt say my hair was as it used to be, as hairdresser has said most of us have thinning hair as we age. My integretive doctor suggested good quality probiotics, and I sourced my own. I alternate between brands daily and also take S Boulardi. I take at least 50/60 Billion in my probiotics a day. Also take Vitamin D3 5000IU per day, despite being in Australia. In the last 2 months my greatly protruding stomach is much less and I am losing weight. Have gone down a dress size without dieting. I also take NAC tablets 3 times a day. I didnt seem to have so many digestion problems or reflux, but I eventually worked out I had a casein problem. Once I gave up milk, I was going to the toilet once or twice daily, with dairy in my diet I was continually very constipated. I do very occasionally have some Brie or some Pecorino and integretive doctor has ok’d me having butter, thank goodness, other than that I am mostly paleo, Absolutely gluten free, I dont eat potatoes, tomatoes, egg plant, but occasionally make a meat sauce with tomatoes. I do have the MTHFR gene c.665C>T and now address that with supplements and make sure I eat cooked greens twice a day. Integretive doctor did tests, and I had big reactions to green beans, pineapple, bananas, cane sugar, black beans and a big range of beans, so these foods have to be avoided at all costs. Thank you Izabella. Silvia – thank you so much for sharing you journey! Some people do take their medications at night without issues. I recommend to take it 1 to 2 hours away from food to ensure good absorption. It should be taken 4 hours apart from iron, magnesium, calcium and activated charcoal. Here are some resources you might find interesting. I go into more detail about supplements and when to take them in my book as well. Time to find a new MD & Endocrinologist. Or you have to educate them. Don’t allow their limited education stop you from finding what will work for you. I speak from firsthand experience & thanks to Isabella Wentz, & several more forums, I have doctors I can work with. It’s your health…take control. You are worth it. I’ve just received my omega 3 capsules, so will start tomorrow. I’ve been losing my hair for several years and have an irritated scalp, my natural health therapist suggests putting a green clay mask on my scalp – maybe it will help. Every other month, I take isphagula husks in water before going to bed to try to cure my leaky gut, early days yet. I’ve completely stopped all dairy products and have greatly reduced acid reflux, perhaps Mary can try either my, or other experiments to reduce/stop her hair loss. I have one or two foot reflexology sessions a month in order to reduce stress and have a little « Me » time and I’m looking into Shiatsu massages next week. I had hair loss too until I started taking 65 mg of iron with vit c daily. Barb – thank you for sharing what has worked for you! Hi -First I want to say Thank you for dedicating your time to educating and helping others. After reading this article I want to try one of the fish oil supplements or cod oil but do not understand which would be best for me. I of course have Hashi, with normal labs. I am on T4 med, take vitamin D 2000u. I have trouble losing any weight, dry skin, hair loss and puffy face. Recently I seen a holistic doc and he put me on a extensive amount of vitamins to help my adrenals. I live a very stressful lifestyle with a demanding job and 3 children. My whole life I was fine until the last 2 years. Since last August I developed anxiety, overwhelming fear and feel like I cannot take on the normal stresses of life at all. My memory is now affected. I could go on with my issues. Jennifer – thank you for sharing your journey. I am so sorry you are struggling with all of this. I understand how overwhelming and hard it can be. <3 Anxiety symptoms are very common in people with thyroid disorders. Here are some article you might find helpful. Dr. I am having thyroid problem since when my son was 8 months old. After delivery my thyroid was normal but but after few months I found under active hypothyroidism. These days I am taking 50 mg thyronorm tablets. I am working so hard to reduce weight but I am getting fail each time..so I’ve decided to start taking seacod capsules( fish oil) for weight loss..but please do let me know is this safe to take fish oil capsules while having thyroid?? If yes then how many capsules should I take in a day? Waiting for your reply. Zaina – thank you so much for reaching out and sharing your journey. I am not able to advise on whether this supplement would be appropriate for you and your specific health needs without a comprehensive health assessment. I recommend that you discuss this with your personal doctor. When it comes to weight gain these are a few things to think about.